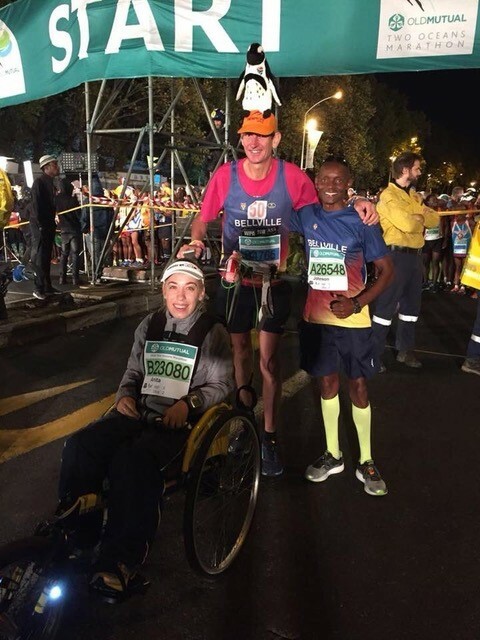 Hilton will be piloting Anita Engelbrecht in a “wheelchair jogger” that they’ve named ‘Blitsie’ for the fourth year in a row at the Two Oceans Marathon. Team Blitsie have traversed the country but there is one hill they fear more than any other – an “absolute killer” that they dread more than Polly Shortts or any of the ‘big five’ hills at Comrades. 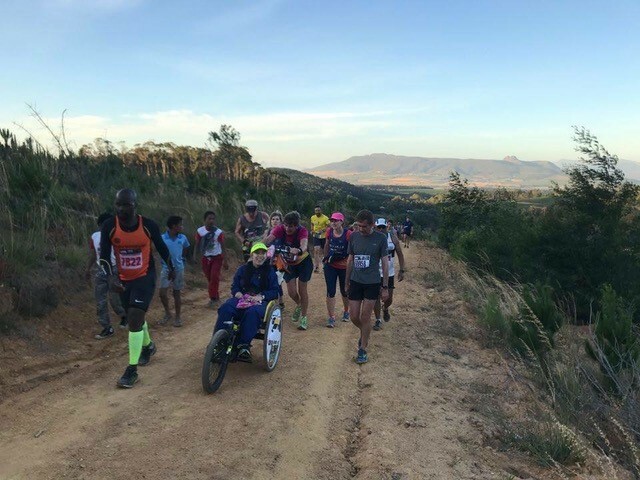 According to Hilton, getting to the top of Constantia Nek stands out head and shoulders as the most difficult hill in the country when pushing a wheelchair jogger. Making the most of the Jogger’s momentum, Team Blitsie are able to sail down Chapman’s Peak and coast into Hout Bay – but from the marathon mark the going gets tough. Hilton explains that he is reduced to a grinding walk up Constantia Nek and usually needs to come to complete stop to every 100m or so just to catch his breath. Hilton simulates the Constantia Nek gradient in preparation for Team Blitsie’s fourth Two Oceans Marathon. Team Blitsie lists the Two Oceans Marathon as their favourite race. Hilton and Anita agree that getting to the top of Constantia Nek is their favourite part of their favourite race – but for different reasons. Anita loves the big crowd of supporters at the summit. 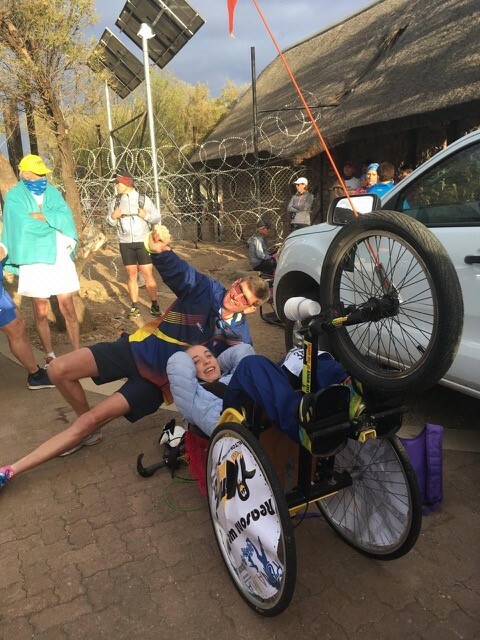 This is one of the best supporter spots on the route as Two Oceans enthusiasts are kept entertained and engaged by the expert commentary of Modern Athlete editor Sean Falconer – short in stature but big on acoustics, Sean goes completely berserk every year as soon as he spots Anita. 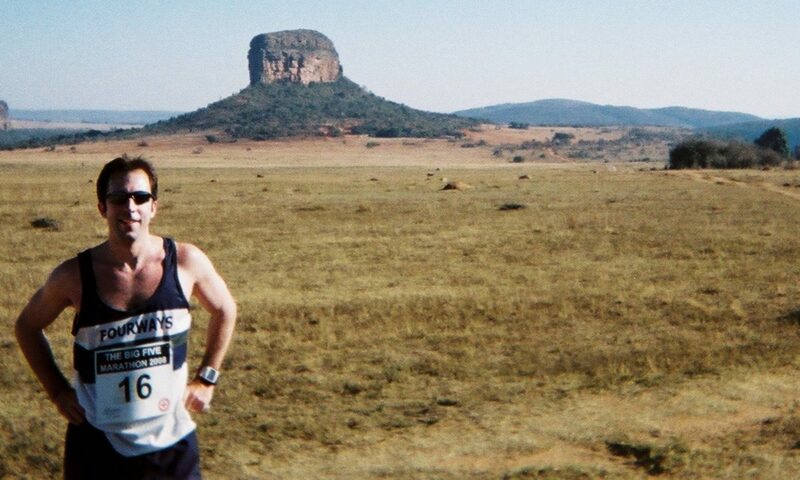 Aside: The story of how Hilton and Anita got to run their first Two Oceans Marathon together is beautifully written up by Sean Falconer – you can read it here. 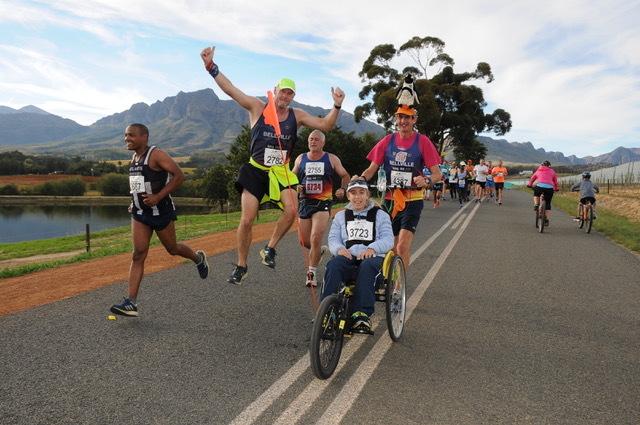 The week before 2016 Two Oceans Marathon, the organisers were put to the test as to whether the race motto #RunAsOne was just a slogan or something that they truly lived by – and it’s great to see that they passed with flying colours. Team Blitsie tests the off-road tyres. Advice for other Blue Medal hopefuls: Definitely start conservatively on the first half of the race. Start racing at the top of Constantia Nek if you still have the urge! Advice for novices: Just enjoy your first Oceans, take in the beautiful scenery and don’t go down Chappies into Hout Bay too fast on the downhill part. Just relax because Constantia Nek will eat you alive if you were showing off too much down Chappies. The real race starts as you enter Hout Bay. Special Two Oceans Marathon memory: Surely our first Oceans with the jogger in 2016 brings back fond memories of hard battles fought just to get allowed to run marathons to qualify for an Oceans entry. OMTOM is Team Blitsie’s favourite race and we have huge support from spectators and fellow runners alike. No stone is left unturned to make this event special every year for the Chaeli Campaign jogger teams taking part. We are treated like royalty, thank you OMTOM! Top tip for conversation with Team Blitsie (and other ‘Joggers’): Please cheer us on – we love conversations with other runners. But remember when we are going up a hill, be that Constantia Nek or Chappies, a quick reply might not be possible from the pusher, as he is fighting for breath or even survival if you look closely! Really enjoyed the article, but why did you put on a photo which does not look like Constanta Nek? Previous PostPrevious Blue at Two Oceans Marathon? Blame your Mother-in-Law!